I’m not a huge sweet fan, and will almost always choose something savoury instead, however sometimes only sweet will hit the spot. 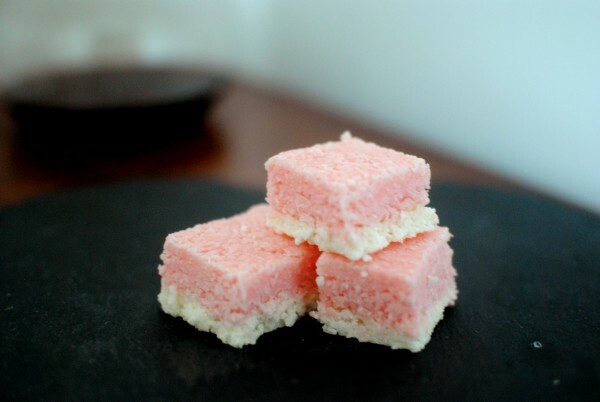 This coconut ice is really quick and easy to make, although I needs to set in the fridge for a few hours, preferably overnight. I make mine in my food mixer because I’m lazy but it can be easily mixed using a bowl and wooden spoon. 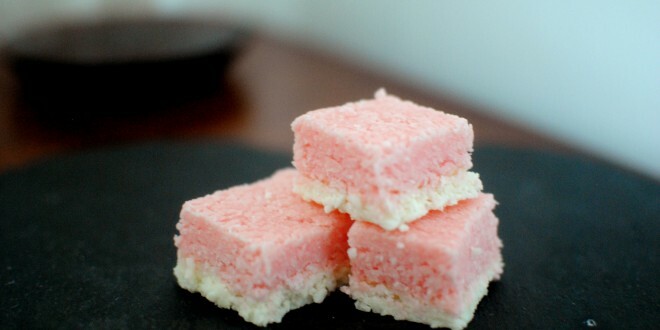 This recipe will give you a nice coconut-y coconut ice, just the way I like it. Grease a small baking tray**. Beat together the icing sugar and condensed milk until you have a smooth paste. Spread the coloured mix on top of the plain one, again at around 1cm thickness and smooth down the top. 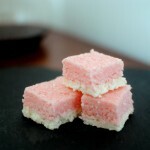 Leave in the fridge overnight then cut into squares. You have my permission to eat any uneven edges you need to cut off. ** I use a 20cm square silicone cake mould, so I don't bother greasing it. The mix doesn't quite fit across of the bottom of my mould, but it's firm enough to hold its shape. *** If you're not adding colour to your coconut ice, spread all the mixture onto your tray, keeping the thickness at around 2cm.